The UM-5J is supplied on tape and reel. 1k pcs per reel is the standard T&R pack size for this product. Partial quantities may be supplied on tape (no reel), or in bulk. The UM5-J surface mount crystal solution features formed lead package and is ideal for designs where ESR value is paramount as this crystal comes with oscillation mode options, including fundamental mode (available up to 55.0MHz), 3rd overtone, 5th overtone or 7th overtone. Available over a very wide frequency range of 1.0 ~ 300MHz, the UM-5J provides a good existing design replacement solution. 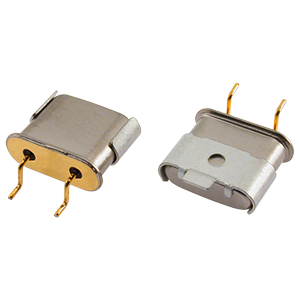 This crystal solution also features a choice of operating temperature ranges including industrial -40 to +85°C, a range of temperature stabilities, as good ±5ppm, and a range of available circuit conditions. To request a quotation for the UM-5J please use the configurable options form to choose the options you require and then submit your configured product to our team. Our expert advisers are always happy to help with your requirements and can be contacted on +44 1460 256 100 or at sales@golledge.com.